Hilary Scott and The New County line will be touring in the UK in July 2013, in conjunction with the Americana Series UK/Europe. This turn of events occurred after Hilary Scott and AJ Gennaro performed as a duo at the Americana Series Morso in Gig Harbor, WA, invited by Michael O’Neill, the series founder, and a singer-songwriter of renown. The series invites the most prestigious and reputable songwriters from the USA and Europe to perform, and Hilary Scott was honored to be invited. Scott and Gennaro will be adding a Saint Louis venue (Americana Series St. Louis) to the Series circuit, and are very excited to be involved in the venue side of the series as well as the artist side. 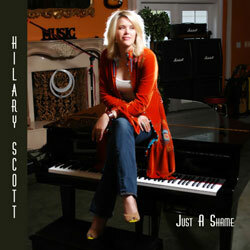 Hilary Scott has just released a new single: Just a Shame – a catchy and lush anthemic pop song, written by Scott and Matthew Wilder (Castle Studios, Nashville). Just A Shame was mastered at the prestigious Georgetown Mastering in Nashville, TN. The download available now on iTunes or get a collector’s edition, autographed, CD-cover-sized sticker/download card at Hilary Scott and the New County Line’s upcoming live shows, or from the Hilary Scott website store.